Auction House 'Profiles in History' claim it will be the largest single Sherlock Holmes collection ever to reach the market. 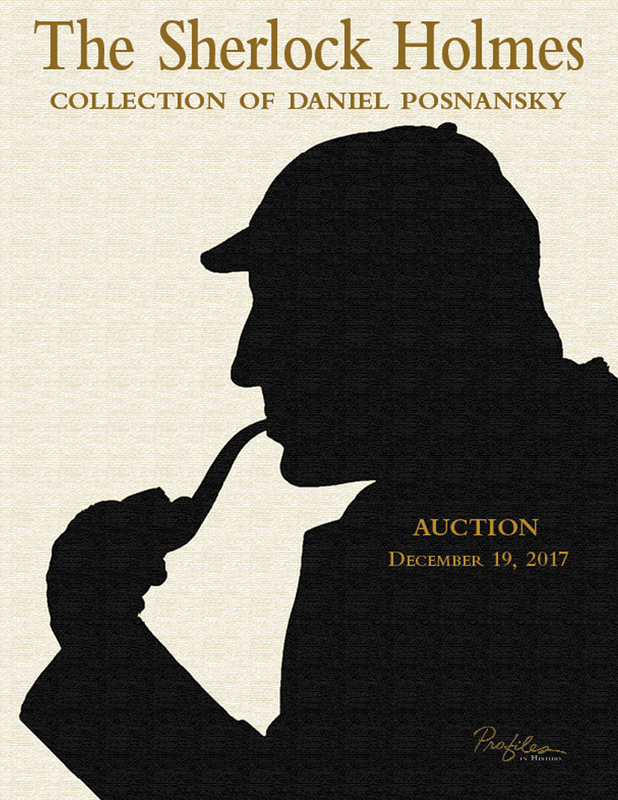 Glen Miranker says of the collection, "The books, manuscripts and ephemera in this catalogue are a testament to Dan Posnansky’s skilled sleuthing and dogged pursuit of Sherlockian rarities. He’s been at it for over 60 years. And for 40 of those years, I’ve been privileged to be Dan’s occasional confederate in the hunt for books, for information, for the back-stories and the “atmospherics” that give a great collection its heartbeat. I’d like to share some sense of what it’s like to go scouting with a Master. I first met Dan, on a Sunday in the autumn of 1976, at a basement book fair at Harvard. I was a complete neophyte; my wife, knowing of my obsession with Sherlock Holmes, had given me my first collectable Sherlockian book only the day before! I didn’t know what was collectible, what questions to ask, where to look … only that I liked Sherlock Holmes. Dan was full of advice, rattling off the shops in Cambridge and Boston that I should frequent. Soon I was making bi-weekly visits and adding finds to my shelves. Some months later, I bumped into Dan again and invited him to see my tiny collection, perhaps occupying six feet of shelf space. The very next weekend he was back at my door, toting several cartons of books. ”Glenny,“ he said, “these are some of the books you need in a Sherlock Holmes collection,” and proceeded to explain each book and why it was important. Among Dan’s haunts were used-furniture stores. He had discovered that many shops didn’t much care about the books that had been left in the cabinets and bookcases they acquired. And he sometimes found treasures among those slighted volumes. One of those stores was known for its once-a-year sale, just before Christmas, of books that had been piling up since the previous January. I remember meeting up with Dan very early, standing in line and shivering together until the doors finally opened. Fast forward to Maine, Dan’s home since 2004. Our scouting trips there always started before dawn, invariably with breakfast at the Maine Diner. Maps show this eatery is in Wells. But to us, the town is known as “Dougville” because it is home to Doug Harding’s bookstore. After feasting on hash, beans and biscuits, we’d cross the Post Road to Harding’s shop, always a good place for bookish conversation and often the source of a new item for Dan’s library. Dan never used a road map on these trips. He (mostly) knew where he was going but we believed that getting lost was crucially important. We might be heading for a particular antiquarian book store, but with great expectations, we would detour for an “Auction Today!” sign. We’d stop at yard sales. We’d gravitate to impromptu flea markets. We’d see a barn ringed with parked cars and we’d park, too, and check it out. Dan’s ability to spot things of collecting value was uncanny. If it wasn’t a book, it would be some artwork, a piece of furniture, an antique tool, something he could sell so he’d have funds when the right book came along. Armed with photocopies and notes, we’d go on foot or by taxi to address after address (fortified by food from Katz’s Deli on Houston Street). Present-day construction has largely replaced the publishers’ original premises. But we did find a few surviving buildings, and some of those bore traces on their brickwork of signage of the long-gone publishers. On one expedition, we were on the lookout for any signs of the Lovell Book Company, the biggest, most successful and most notorious of the pirateers. Alas, there was nothing of interest at Lovell’s onetime address, 52 Duane Street. But half a block away, we did make a discovery that still makes us smile. Looking up, we found ourselves at the intersection of Duane and Reade—and speculated that the pharmacy chain must have had its origins there. Spending time with a gifted collector can rub off. Researching the pirateers with Dan and seeing his finds over the years has made me somehow cagier, luckier, more inventive. Once I’d seen a book of his, pirates especially, I would happen upon a variant edition within weeks. Who knows why, but it’s happened so often I call it the Posnansky Effect. I see him kick along main-yard. So the two were united in their distaste for the pirateers larcenous ways. Dan’s Gillette Doll is one of the most direct and intimate connections to William Gillette imaginable. The doll was made for Gillette on the occasion of the opening of the play Sherlock Holmes in 1899. It is claimed, and widely believed, the doll’s costume was made using cloth that was also used to make the original costumes for Gillette. The play marks the first appearance of Sherlock Holmes in a commercial stage production. Gillette, in fact, invented many of the props and mannerisms we consider quintessentially Holmes, as he created the role. Sometime after the opening, Gillette presented the doll to Faith Baldwin, a rather successful author of romance novels and an attractive actress. Sometime after Baldwin’s passing, her maid brought it into a shop where Dan came upon it. Yet another example of luck favors the prepared. But thanks to Dan—his casual wisdom, his generosity and his pleasure in the chase—I greet every day with the hope of a great find.